This article launches a series introducing datastructures and algorithms. In Part 1, you'll learn what a datastructure is and how datastructures are classified. You'll also learn what an algorithm is, how algorithms are represented, and how to use time and space complexity functions to compare similar algorithms. Once you've got these basics, you'll be ready to learn about searching and sorting with one-dimensional arrays in Part 2. [A] mathematical model for data types where a data type is defined by its behavior (semantics) from the point of view of a user of the data, specifically in terms of possible values, possible operations on data of this type, and the behavior of these operations. An ADT doesn't care about the memory representation of its values or how its operations are implemented. It's like a Java interface, which is a data type that's disconnected from any implementation. In contrast, a datastructure is a concrete implementation of one or more ADTs, similar to how Java classes implement interfaces. There are many kinds of datastructures, ranging from single variables to arrays or linked lists of objects containing multiple fields. All datastructures can be classified as primitives or aggregates, and some are classified as containers. The simplest kind of datastructure stores single data items; for example, a variable that stores a Boolean value or a variable that stores an integer. I refer to such datastructures as primitives. Many datastructures are capable of storing multiple data items. For example, an array can store multiple data items in its various slots, and an object can store multiple data items via its fields. I refer to these datastructures as aggregates. All of the datastructures we'll look at in this series are aggregates. Anything in which data items are stored and retrieved could be considered a datastructure. Examples include the datastructures derived from the previously mentioned Employee, Vehicle, Array, and List ADTs. Many datastructures are designed to describe various entities. Instances of an Employee class are datastructures that exist to describe various employees, for instance. In contrast, some datastructures exist as generic storage vessels for other datastructures. For example, an array can store primitive values or object references. I refer to this latter category of datastructures as containers. As well as being aggregates, all of the datastructures we'll look at in this series are containers. The Java Collections Framework supports many kinds of container-oriented datastructures and associated algorithms. This series will help you better understand this framework. It's become fairly common practice to use design patterns to introduce university students to datastructures. A Brown University paper surveys several design patterns that are useful for designing high-quality datastructures. Among other things, the paper demonstrates that the Adapter pattern is useful in the design of stacks and queues. The demonstration code is shown in Listing 1. Listing 1 excerpts the Brown University paper's DequeStack class, which demonstrates the Adapter pattern. Note that Stack and Deque are interfaces that describe Stack and Deque ADTs. MyDeque is a class that implements Deque. The original code that Listing 1 is based on didn't present the source code to Stack, Deque, and MyDeque. For clarity, I've introduced @Override annotations to show that all of DequeStack's non-constructor methods override Stack methods. DequeStack adapts MyDeque so that it can implement Stack. All of DequeStack's method are one-line calls to the Deque interface's methods. However, there is a small wrinkle in which Deque exceptions are converted into Stack exceptions. 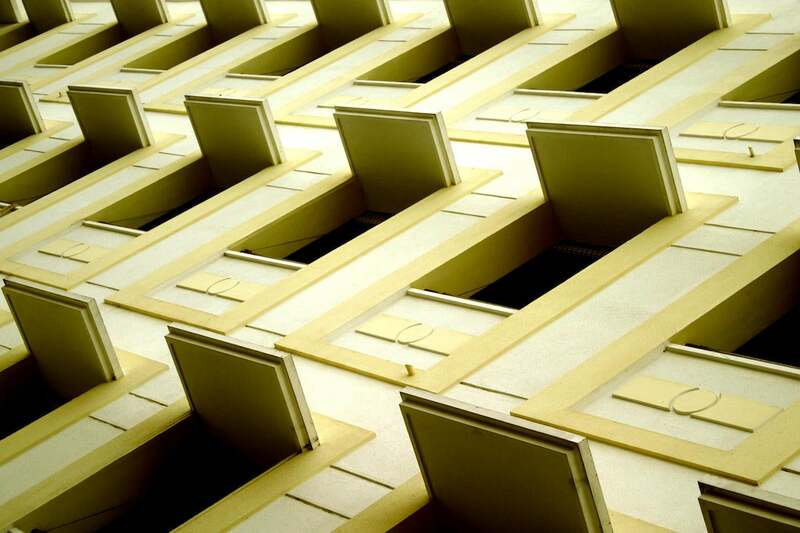 Using design patterns is a novel way to teach datastructures. If you would like to learn more about this practice, check out the Brown University paper, "Teaching datastructure design patterns," or Rice University's "Design patterns for datastructures." Additional design patterns presented in the Brown University paper are Template Method for tree and graph traversals; Decorator for balanced trees and graphs; and Iterator for sequences, trees, and graphs. Note that while programs may be algorithmic in nature, many programs do not terminate without external intervention. Many code sequences qualify as algorithms. One example is a code sequence that prints a report. More famously, Euclid's algorithm is used to calculate the mathematical greatest common divisor. A case could even be made that a datastructure's basic operations (such as store value in array slot) are algorithms. In this series, for the most part, I'll focus on higher-level algorithms used to process datastructures, such as the Binary Search and Matrix Multiplication algorithms. How do you represent an algorithm? Writing code before fully understanding its underlying algorithm can lead to bugs, so what's a better alternative? Two options are flowcharts and pseudocode. A flowchart is a visual representation of an algorithm's control flow. 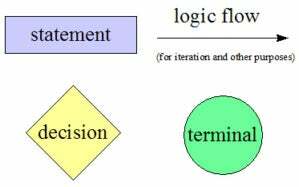 This representation illustrates statements that need to be executed, decisions that need to be made, logic flow (for iteration and other purposes), and terminals that indicate start and end points. Figure 1 reveals the various symbols that flowcharts use to visualize algorithms. Consider an algorithm that initializes a counter to 0, reads characters until a newline (\n) character is seen, increments the counter for each digit character that's been read, and prints the counter's value after the newline character has been read. The flowchart in Figure 2 illustrates this algorithm's control flow. It's easy to introduce errors or inaccuracies into highly-detailed flowcharts because of the tedium associated with drawing them. It takes time to position, label, and connect a flowchart's symbols, even using tools to speed up this process. This delay might slow your understanding of an algorithm. Flowcharts belong to the structured programming era and aren't as useful in an object-oriented context. In contrast, the Unified Modeling Language (UML) is more appropriate for creating object-oriented visual representations. 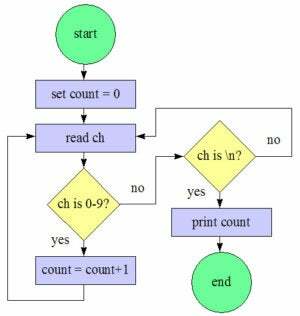 An alternative to flowcharts is pseudocode, which is a textual representation of an algorithm that approximates the final source code. Pseudocode is useful for quickly writing down an algorithm's representation. Because syntax is not a concern, there are no hard-and-fast rules for writing pseudocode. The pseudocode first presents a couple of DECLARE statements that introduce variables ch and count, initialized to default values. It then presents a DO loop that executes UNTIL ch contains \n (the newline character), at which point the loop ends and a PRINT statement outputs count's value. For each loop iteration, READ causes a character to be read from the keyboard (or perhaps a file--in this case it doesn't matter what constitutes the underlying input source) and assigned to ch. If this character is a digit (one of 0 through 9), count is incremented by 1. CPU time (for algorithms that interact with those datastructures). It follows that you should be especially mindful of the algorithms and datastructures you use for applications that will process lots of data. These include applications used for big data and the Internet of Things. When choosing a datastructure or algorithm, you will sometimes discover an inverse relationship between memory usage and CPU time: the less memory a datastructure uses, the more CPU time associated algorithms need to process the datastructure's data items. Also, the more memory a datastructure uses, the less CPU time associated algorithms will need to process the data items--leading to faster algorithm results. As much as possible, you should strive to balance memory use with CPU time. You can simplify this task by analyzing algorithms to determine their efficiency. How well does one algorithm perform against another of similar nature? Answering this question will help you make good choices given a choice between multiple algorithms. Some algorithms perform better than others. For example, the Binary Search algorithm is almost always more efficient than the Linear Search algorithm--something you'll see for yourself in Part 2. You want to choose the most efficient algorithm for your application's needs, but that choice might not be as obvious as you would think. For example, what does it mean, from an efficiency perspective, for the Selection Sort algorithm (also introduced in Part 2) to take 0.4 seconds to sort 10,000 integers on a given machine? That benchmark is only valid for the machine on which the algorithm's implementation runs, for the implementation itself, and for the size of the input data. A time-complexity function measures an algorithm's time complexity--meaning how long an algorithm takes to complete. A space-complexity function measures an algorithm's space complexity--meaning the amount of memory overhead required by the algorithm to perform its task.